Pigeons can sometimes choose a nesting spot that is inconvenient or worrisome for a home owner or apartment dweller. 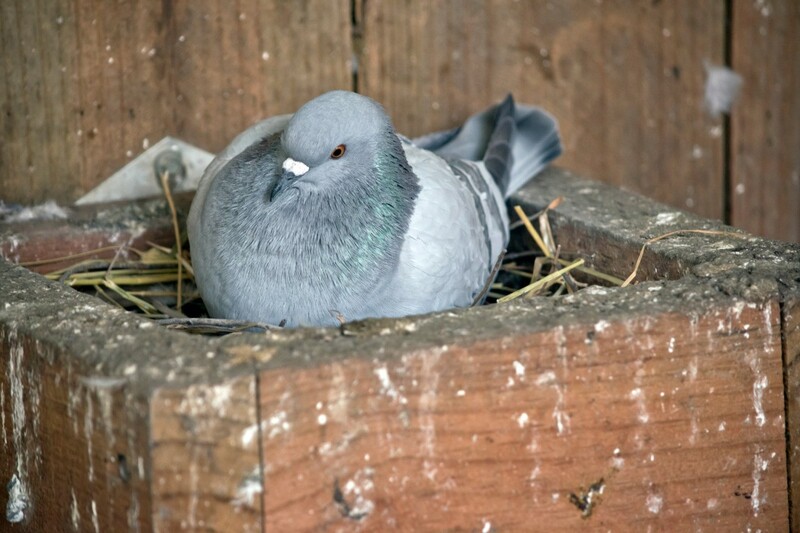 If she has already laid eggs you can read on to see some ideas on what to do about a nesting pigeon and discouraging future nests. This is a guide about getting rid of a nesting pigeon. A pigeon is nesting on my apartment balcony with two eggs. I am leaving to live in another apartment in ten days and have to clean everything. What do I do? With pigeons, if you move the nest, the mother pigeon will abandon the nest, possibly. Also, unless the bird is a Rock Pigeon, European Starling, or a House Sparrow, it is illegal to touch or move the nest. Talk to the landlord. I would not touch it myself or do anything other than make sure the balcony is swept clean (the floor). Let the landlord deal with it. Be sure to take photos and have documentation of who you talked to and when if they use this as an excuse not to refund the security deposit. As a general rule, pigeons are not a protected species in the U.S. (but may be in other countries) with the exception that you cannot just out and out kill them. You should check within your own state/city/county by contacting the US Fish & Wildlife just to be sure. Here are 2 links that will help you find your state and who to contact. It should be easy and you will have an answer immediately. The feral pigeon is an exotic species in North American and is listed as an unprotected species by the U.S. Fish & Wildlife Service and as feral livestock by the Florida Fish and Wildlife Conservation Commission. The birds, their eggs and nests may be removed by any method except by poison, steel traps, or with guns and lights at night. Some municipalities have issued local ordinances that protect all birds, both exotic and native. Be sure to check with local authorities before starting any bird control activities." This site has a good picture of these pigeons (fig. 1). You should take pictures of the pigeon and nest just to be sure as some people mistake pigeons for doves and different rules may be involved. How do I get rid of a pigeon who has made a nest with 2 eggs on my roof top deck (it's in a planter)? Help. I hate pigeons. First get rid of the nest. Then place a plastic toy in the planter where the nest was. If it is large you may have to use several toys. Don't know why but they dont like the toys. It actually won't be there long, in about three weeks the eggs will hatch, couple or three more weeks and the babies will be gone. Just make sure to rig the planter to where they won't come back next year. Put something inside, like the previous poster suggested? That's cruel to rip that from the Mother. Pigeons are very gentle creatures and you want the babies dead? I wouldn't want you any where near me or mine. What is she hurting? What joy do you get by being mean? I would love an answer. Wow. The bird and her young won't be there that long. Moving a nest is risky and the mother may not find where you place it and you may place it in an unfavorable spot. When they leave just move your planter. I'd love to watch the eggs hatching and the young birds developing. I think you are lucky!